Often I need a welder straight after I have loaned my best welding machine to a mate and the slap on the forehead reminds me that I need welders, not just one but many. How often have you been in need of welding equipment but are too far away from the shop? How many times did you need a welder but there was a line at the stores desk and you wished the boss had bought more welding machines? 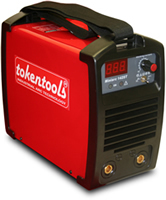 Tokentools can help you not only get the welding equipment you need but also provide significant savings over the mainstream welding machine brands. We are an independant welding equipment manufacturer, we ship welding machines Australia wide daily and we have the welding industry recognised best warranty, 5 full years of parts and labour warranty protection. Call us on 1300 881 991 to discuss your welding needs today and our helpfull staff will endure you get equipped with the right machine for your welding project.